George Washington Carver was an American scientist most notable for the many uses that he found for the peanut. He was born in the 1860's as a slave, but he was freed at a young age after the end of the American Civil War in 1865 (though the game claims that he was freed with Abraham Lincoln's Emancipation Proclamation in 1863; though technically accurate, Carver was born in Mississippi, which was a part of the Confederate States of America and thus, did not follow Lincoln's orders until the Civil War's end). He then studied diligently and eventually became the first black student of Iowa State University (though the game also claims that he was the first black person to receive a master's degree in agriculture). After graduating, he became a teacher at the Tuskegee Institute in Tuskegee, Alabama, at the request of headmaster Booker T. Washington, and in his time there, he spent many years studying the peanut and other plants, alongside the development of crop rotation to enrich the soil after it was dried out from years of cotton farming. According to Mario's Time Machine, as George Washington Carver was working on producing peanut oil in 1915 when Bowser travels back in time and steals a Crank Handle from Carver's pressing machine, preventing him from making peanut oil. Mario later travels back in time to return the handle, but as he does not know that it belongs to Carver, he talks to some of the other people in Tuskegee about it, including Booker T. Washington, business mogul Henry Ford (despite Carver and Ford only meeting long after 1915), and one of Carver's students. All of them freely and learnedly talk about Carver's innovations and history. If Mario attempts to talk to Carver beforehand learning anything from the others, Mario introduces himself and asks Carver if he can enter his lab. Carver refuses, as though he normally welcomes visitors, he is working on an important experiment that may prove the worth of peanuts After Mario definitively confirms that the Crank Handle belongs to Carver, he promptly delivers it to him (while also making a pun and describing it as a "nutty thing"). Carver then exclaims that he was looking for exactly that, and briefly explains why he needed it. Mario asks how he was able to find so many uses for the peanut, and he replies that he studied it for a long period of time. He then comments that small objects can carry a huge amount of surprises, then acknowledges Mario's size (stemming from a continuous joke about how Mario is significantly smaller than everyone else, with many people pointing this out). 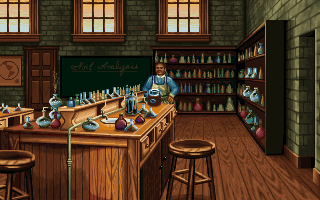 The game also claims that Carver was widely known as the "Root Doctor"; beyond the fact that he was very infrequently called that, a "root doctor" was a term that described people using Hoodoo (a kind of voodoo magic), and not a proper noun as the game uses it. ↑ Kremer, Gary R. "Early Years." George Washington Carver: a Biography, Greenwood, 2011, p. 1. ↑ "History.com Staff". (2009) George Washington Carver begins experimental project with Henry Ford. History.com (Wayback Archive). Retrieved September 8, 2017. ↑ Hutchins, Zachary. "George Washington Carver: Advocate for Southern Farmers." docsouth.unc.edu, Documenting the American South, 2004. Retrieved September 8, 2017.